The Ashley Wood Festival takes place at Ashley Wood Farm, on the outskirts of Tisbury in South-West Wiltshire. Tisbury is easily accessible by train - it is on the Exeter-Waterloo line, one stop on from Salisbury. 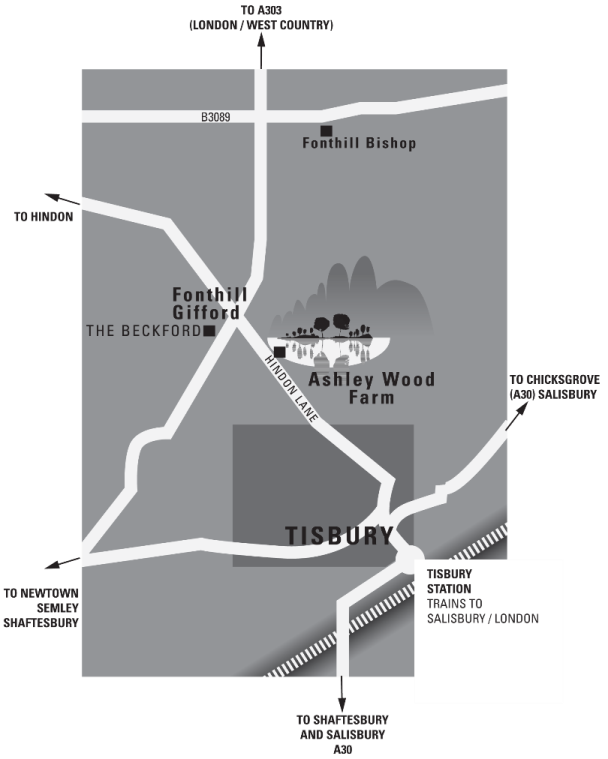 Tisbury is just a few miles from the A303 and the A30, and there are car parking facilities at Ashley Wood Farm. The postcode of the venue is SP3 6PY. There are two tracks that lead down to the farm. You want to take the one with the festival banner at the top (second on the left if you are coming from the Beckford Arms towards Tisbury). Why not get the train to the festival? The Tisbus (a community bus service) will be picking up at Tisbury station at 1pm on Saturday 10th August, and running from the festival site to the station again in time for the train at 9pm.